Between 2000's You Think it's Like This But Really it's Like This and 2001's Advisory Committee, Olympia's Mirah Yom Tov Zeitlyn demonstrated a knack for fluctuating between sweet and thundering, much of the latter assisted by Phil Elvrum's production, which gave percussion as much power as Mirah's buttery voice. 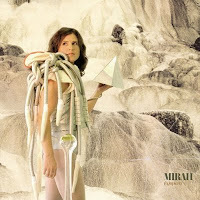 Eight years and several collaborative albums later, Mirah's voice is untouched by those years, still a soothing layer above thickly-produced strings (“Generosity”), haunting harmonies with herself (“The World is Falling”), delicate finger-picking of the kora (“Shells”) and flamenco fusion (“Country of the Future”). Scattered, yes, but it's all her, and the second half of the record is the Mirah of 2000, simple guitar, lo-fi vocals and lyrics literate, sharp. But, oh, when the minimal “Skin and Bones” appears, it becomes suddenly apparent that what sets Mirah apart from a number of singer-songwriters is how closely you can hear her voice, every breath and note so cozily nestled in your ear that her most intimate moments of song seem to be taking place right beside you. But then, when you've grown comfortable, she'll run off into an echoed harmony with herself and perhaps – though not this time – fall into a tunnel of highly-produced percussion just to catch you off-guard.